Ugh! The dreaded talk. You know the one. The talk that everyone should have with their kids. The one where you have to use real names for body parts and go into details about the birds and the bees. Yeah, I know that talk. My husband and I decided that he would talk with our boys and I would talk with our girls. We have two of each. He’s already talked with our boys, and I have had the talk with one of our girls. One more to go for me. This book is great for a follow-up of that talk. Here’s my book review of Boying Up by Mayim Bialik, PhD. “Growing from a boy into a man is no simple feat. Bodies are changing, social circles are evolving, hair is appearing in places it never was before—and on top of it all, there’s the ever-present pressure to conform to the typical idea of what it means to be ‘manly’ and masculine. But it’s easier to Boy Up if you’re armed with facts. Want to know why your voice cracks like that? What you should eat to build muscle, or how to talk to someone you have a crush on? How about if someone bullies you or spreads rumors about you? 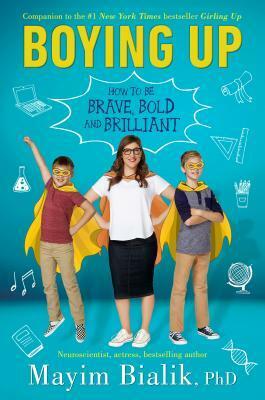 Using her own experience as a mom of boys and plenty of scientific information, Mayim Bialik, neuroscientist and star of The Big Bang Theory, talks about what it means to grow from a boy to a man biologically, psychologically and sociologically. This book is packed with great information! Mayim Bialik does not mince words. She speaks boldly and bravely about everything that happens when boys grow into men. The first thing she discusses is anatomy for boys and girls. There are even drawings to go along with it. It’s very straightforward and accurate. She uses the correct names for everything and says it like it is. I like that she even goes into the science of X and Y chromosomes and DNA. Throughout the book, Mayim talks a lot about how everyone is different. She discusses how there isn’t one right way to be a boy. It’s so good to hear because there are stereotypes for boys just like there are for girls. She talks about how it’s ok for boys to like different things and look different from each other. Not all boys need to like cars and sports. I love the section on how to take care of their bodies. I think all YA boys need to read this section. Seriously. I know they want to survive on soda pop and candy bars. Mayim goes into a lot of detail about how much water to drink each day, proper nutrition, and mindfulness when eating. She also talks about the importance of exercising. She gives lots of different ways to exercise; it doesn’t need to be football practice for every boy. Mayim doesn’t stop there. I loved the chapter on how boys learn. She is a neuroscientist, so she has very detailed and interesting scientific facts. One thing I thought was really good was when she discussed the culture of media among boys and how they like video games and such. I guess there is actually science behind why boys get all competitive and like to win. She does talk about why some boys are more bothered by violence and other things in media. I agree that there are different sensitivity levels. I also think that sometimes that is because children are desensitized by watching violence and more adult themes when they are too young. I don’t allow my children to watch PG-13 movies until they are 13. And even then, there are certain movies I won’t let them watch until they are older. How boys love is the next chapter in the book. Mayim goes into intimacy, but intimacy as in getting to know someone well and making ourselves vulnerable. She talks about relationships with family and friends and how those can change over time. One thing she goes into more detail about is “Brotherhood” and boys as “their buddies, their bros, their homeboys, their dudes, their posse.” There are lots of different places that boys can find their peeps. I know it’s hard for most parents to discuss this with their children. It is for me! It’s essential, though. Mayim goes into detail about it, of course using correct body part names and how it occurs. One thing she stresses is that it does feel good, but it is primarily to make babies. And that if you are doing it, you will most likely make a baby at some point. This is a good reminder for teenagers with raging hormones. She talks about how waiting until marriage used to be the norm, but isn’t as common now. We have stressed to our children that waiting until marriage is important. I think it’s important because it is so intimate. There are emotions and feelings that occur when people are intimate in that way, and being in a stable, strong relationship is important. Then, if babies come, there is already a foundation for that family. She also discusses that it’s a special thing; it’s not evil and you shouldn’t be afraid of it either. But use precautions. Be safe. This book goes deep into many things that are difficult to talk about. It’s very informative. Although there is a lot of information, good and very detailed information, Mayim does a great job of making it accessible. Her writing is so easy to read; it’s not awkward or scary or anything. This book should be used as a companion to a parental discussion. It would be great to have your son read a chapter and discuss it, or discuss it at the end. Boys and dads could read it together. My boys might die if I read it with them.